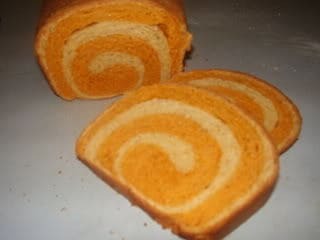 This tomato swirl bread is a recipe I created several years ago. I took a recipe for tomato bread and combined it with a recipe for plain bread — perfection! I love the combination of tomato soup and toasted cheese and this is one of those breads that goes perfectly with that combination. 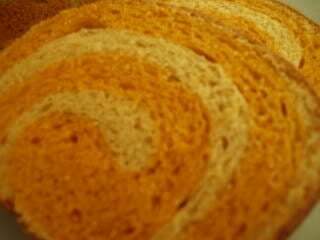 Tomato swirl bread is a recipe that I came up with a couple of years ago. I love tomato soup and toasted cheese, I mean who doesn’t, right? Well this bread is the perfect bread for the toasted cheese sandwiches that you dunk into the soup…It is also fantastic with summer salads and anything else you want to make. I originally posted this in 2007 and I need to update the images….In the meantime give this a try…it really is good. YUM! This has a faint aftertaste of tomato soup! A beautiful bread swirled with tangy tomato dough. It is perfect for grilled cheese - has a taste reminiscent of tomato soup. Heat tomato sauce, butter, and ketchup together and mix well. Add sugar, cloves, salt and yeast mixture to tomato mixture. Mix in enough flour to make a soft but kneadable dough. Rub lightly with oil and set aside to rise. Soften yeast in 1/4 c water with sugar. Microwave the 11/2 cups water until very hot. Add butter to the 1 1/2 cups water, stirring until butter melts. Add salt and yeast mixture. Add flour until you get a soft, kneadable dough. Proceed with the dough as you did with the tomato dough. Let balls of dough rise until double-about 1 1/2 hours. Cut each ball of dough into 2 equal pieces. Roll each ball out into a rectangle of equal sizes. Place a tomato dough rectangle on top of a plain rectangle and roll up tightly pinching dough together at bottom to seal. Let rise in greased bread pans for 1 hour or until double. Bake at 375 for 30 minutes or until loaves sound hollow when tapped...Let cool if you can. Liz I have never heard of yeast in a communion bread. :/ Nope, no recipe, sorry.